High up in the stratosphere, frozen and with ice crystals within you will find those typical winter clouds. 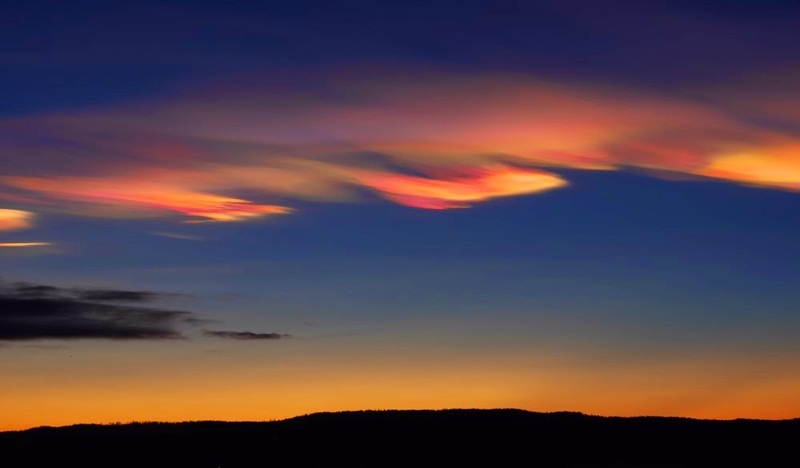 From wiki: Polar stratospheric clouds or PSCs, also known as nacreous clouds (/ˈneɪkriːəs/, from nacre, or mother of pearl, due to its iridescence), are clouds in the winter polar stratosphere at altitudes of 15,000–25,000 meters (49,000–82,000 ft). They are best observed during civil twilight when the sun is between 1 and 6 degrees below the horizon. They are implicated in the formation of ozone holes. The effects on ozone depletion arise because they support chemical reactions that produce active chlorine which catalyzes ozone destruction, and also because they remove gaseous nitric acid, perturbing nitrogen and chlorine cycles in a way which increases ozone destruction.